We will not become accustomed to death. We will fight for life. On Tuesday July 11th a 42-year-old woman who worked at the “Karypidis” supermarket chain in the city of Giannitsá ended her life. She was one of 1,400 workers who have spent the last 18 months unpaid for their work by the firm. The company has a long tradition of fraud, arbitrariness and exploitation of workers, say critics. The Karypidis brothers bought the supermarket chain, originally known as Arvanitidis, in 2004 when it was in danger of closing under the weight of huge debts to IKA, the workers’ social security fund. Once the buyout was completed, a confiscation order linked to the debts amounting to €18,250,000 was “lifted,” allegedly with the direct intervention of former IKA secretary Rovertos Spyropulos. Spyropulos, who said the measure was taken to allow the company to keep operating and pay off some of its other debts, was prosecuted on felony charges related to the “initiative” in 2014 but eventually acquitted. In early 2017 the company once again filed for insolvency. Nonetheless, it continues to make a profit, failing to pay workers and using various excuses to mislead, such as a need for sanitation and the “rationalisation” of the company, blaming previous management (from 13 years ago when it was called “Arvanitidis”). It has even tried pinning the company’s poor economic situation on the workers’ unions! At this moment the 1,400 workers of the supermarket chain are still not receiving their salaries and their jobs are still not assured. They are in a state which oscillates between captivity and unemployment. They do not receive the retention allowance, nor are they entitled to receive unemployment benefit. Laws on employee rights during the transfers of undertakings to other companies (eg. Discount Market, Masoutis, Market Inn, etc.) were not implemented. Recently, after bosses appealed to the supreme court, it was ruled that a company’s employers not paying the wages of their workers for a long time does not contribute to worsening working conditions — confirming once more that justice has a class character. It takes sides with the powerful, the oppressors and the exploiters. The extreme exploitation that the workers are suffering combines with the firm’s other malpractices. The Syriza government has criticised the attitude of the Karypidis brothers, who are striving to repair their leftist profile* while contributing to the continuing impoverishment of the majority of society by voting for a series of anti-worker laws which are in accordance with the demands of local and international capital. They are deaf to the demands of strikers or attempt to neutralise their protests, sometimes through collaboration with union leaders and sometimes with riot police. This imposed Middle Age workplace is the result of policies impoverishing the lower clases, as required by the violent restructuring of Capital. Sweatshops are occupying more and more space in the modern labour reality. Exhausting working hours, unpaid working hours, precarious and intensified work (mostly without social security), as well as the absence of security measures, on the one hand annihilate the workers on a daily basis, and the same time continue to profit bosses, who reach extreme levels of wealth through the murder of workers. Those who speak of incidents like these as isolated and non-interconnected, as simply the bad luck of the workers, do not want to see the essence of the problem. These outcomes are innate to capitalism, it is the barbarity of Capital that reproduces itself by taking advantage of human labor and the degrading of our lives. Bosses talk about labour accidents, putting the blame on the workers, but for us these are clearly murders for which the bosses are responsible. The profit of employers does not take into account human life, hence the lack or deficiency of safety measures in the workplace. 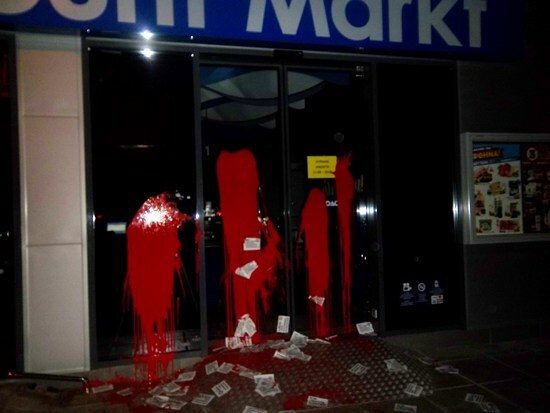 On July 13th we conducted an intervention, distributing leaflets and throwing paint at the Discount Market store in the neighborhood of Xirokrini, Thessaloniki which belongs to the Karypidis brothers, trying to express the direct responsibility of the supermarket chain’s bosses for the suicide of the 42-year-old worker in the city of Giannitsa. For as long as we do not organise ourselves and do not challenge poverty, if we sink into despair instead of fighting, we will count the dead of our class. It is imperative to organise a combative and hard base unionism to stop people being bullied by their employers, whether small or large, with the consent of business unions calling for “peace” with our class enemy. Let us put the interests of the workers first and take life in our hands, without hierarchies, mediations and paternalisms. Let us prepare general, indefinite strikes, connecting them with a revolutionary proposal whose goal is personal and collective emancipation, the end of the exploitation of man by man, and social self-management. We will not become accustomed to death. We will fight for the life and emancipation of all humans through self-organised social and class formations. * Theodoros went so far as to stand for Governor of West Macedonia on a Syriza ticket before getting caught up in an [url=https://kis.gr/en/index.php?option=com_content&view=article&id=510:announcement-of-the-central-board-of-jewish-communities-in-greece-regarding-syriza-party-candidates-antisemitic-statements&catid=9 eltiatypoy&Itemid=32]antisemitism scandal[/url].